Love Goddess Venus is in sensitive Cancer from May 19th to June 13th, 2018. Venus in Cancer brings romantic, sentimental and nostalgic overtones to your relationships. It is an excellent time to play happy families, snuggle up with your one and only, or find someone wholesome and caring to love! …indulge in some old fashioned romance! …care for your loved ones. …nurture and renew family bonds. …focus on what nurtures you and makes you feel secure. …beautify and enjoy your home. ...sport a more romantic look. …acknowledge your own vulnerable side and need to be loved. Sometimes people put up a die-hard front with Venus in Cancer. That’s all an act, the purpose of which is to avoid getting hurt. So, do not be fooled by Venus in Cancer’s tough gung-ho outer shell. It's really hiding an inner softie! Tread with sensitivity. If you enjoy love-games, then remember that people's feelings are more easily hurt during this period. Before you do something wonderfully clever think first: are you taking others’ feelings into consideration? What does Venus in Cnacer hold for your Star Sign? The annual visit of Venus in Cancer means something different for each sign. This year it makes its visit early in spring, May 19 - June 13, 2018 to get you into a romantic mood for summer! 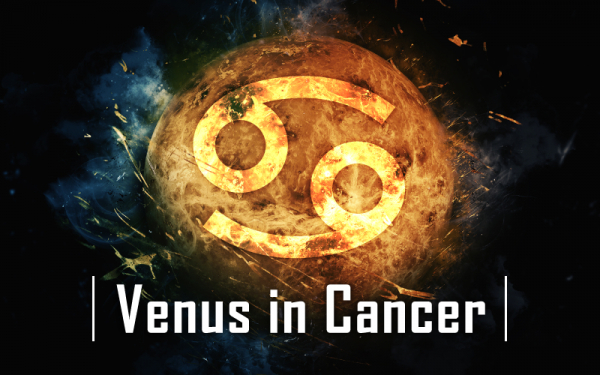 Read on to find out how Venus in Cancer affects your star-sign! You can also call a gifted relationship psychic right now on 0207 111 6384 for the UK or 1877 608 3731 from the USA for a personal reading more tailored to your needs! Venus in Cancer activates your home and family zone, which means you are likely to feel twice as homey and eager to be around familiar faces than everyone else. Time to rekindle bonds with the family, decorate your home, tend to your garden, enjoy some home cooked family meals and generally snuggle up with your loved ones! Happiness, love and romance are to be found at home. Now that you are feeling comfy at home you could also get in touch with one of our top psychics. Your communication skills are enhanced with Venus in Cancer. You are very popular and can act as a go between to reduce tensions in the family, renew your bonds with a sibling, negotiate tricky terrains and generally help find common ground. Lots of pleasant interactions, communications at home and a warm time with loved ones are in store. Happiness, love and romance are to be found on the train, via text and in your day to day exchanges with others now. Do you have someone in your sights? Venus in Cancer highlights good old family values and urges you to think about what you value most in a relationship. This is also a time when you can see your finances grow and flourish, care for your physical body and develop your talents - a little like tending to your own beautiful garden of delights! On the other hand, you may also be more inclined to spend for pleasure now! This is a time when you want to see tangible tokens of love, cash in on your happiness and spend a little extra to enjoy true romance. If money is becoming an issue, check in with your Gemini daily horoscope for tips! The time for love and romance is finally here for you, dear Cancer! The love goddess is in your sign making you irresistible and helping you attract the right kind of attention. You are popular too, which means you can promote yourself and your interests and find that these have wider appeal. This is also the time for you to tend to your looks: choose this time if you want to renew your wardrobe, accessories or hairstyle, while the goddess of beauty watches over you! Make sure you look the part, for love and happiness are making their way to you! Venus in Cancer is a time for you to enjoy a private retreat and let the world make do without your brilliance for just a little while. It’s the time for you to focus on those things that nurture you and make you feel safe and whole inside. If love is in the air, then it is a rather hush-hush affair and this is the time to keep it that way. No bright lights please! Happiness, love and romance are to be found in solitude and meditation or simply away from prying eyes. This is a highly sociable and aspirational time for you, dear Virgo, when you can catch up with dear friends and get in touch with all those people who make you feel right at home. You are popular too and can do much to further your dreams and aspirations now, nurturing your hopes for the future - a future more to your liking. Love and romance abound in your social circles and in dreaming up a better world. There's also much joy to be had with friends. You can do much to promote your public image now and to show your most caring, loving and gifted face to the world. Venus in Cancer can help you show off your artistic, aesthetic and negotiating talents and attract the right kind of attention from higher ups. Love, romance and happiness are to be found at work and…in an adoring public, if you go in for that sort of thing... Time to put on a good show! What are you meant to be doing in your life? Venus in fellow water sign Cancer opens up new opportunities for happiness, love and romance for you, dear Scorpio. You may decide to go on a romantic holiday abroad, spend quality time with family to raise your spirits, or tend to home abroad. Your desire is awakened to try out new experiences that promise a deeper emotional bonding with those you care about, as well as a renewed sense of hope which makes the wider world look much rosier. You can do much to market and promote your interests now, for public opinion is on your side! Want to make it official? Cancer is a sign very unlike your own, dear Sagittarius. It's all about bonding, security and needing to be close to someone, whereas you tend to prefer your freedom, lots of room to roam and for situations not to get too emotionally sticky! While you may feel uncomfortable in close quarters, which is what Cancer rules in your chart, Venus in Cancer is a time to enjoy greater intimacy with someone! It’s a time to actually get emotionally involved and...enjoy it! It’s also a good time for joint finances - for instance to sort out any family or business affairs. Venus in Cancer highlights your one-to-one relationships. Someone else seems to be holding all the cards - financially speaking - and you have to defer to them, especially when it comes to household matters. Or it may be that someone is so charming right now that you can do little to resist! Your significant other (or business partner!) may act all sensitive and moody right now, so make sure to treat them kindly, something a stern Capricorn may often forget... Let others brighten up your world by showing you their soft and squishy side and do your best to respond in kind. You are a highly independent sign and Venus in needy and sentimental Cancer may seem a little too clingy for your taste. However, one area in life where you can be quite emotional is your work! Venus in Cancer is a great opportunity to bond with your work-colleagues or employees, and to create a wonderful family feeling at work. Of course, families also have their differences so try to remain sensitive on that point and navigate any tricky emotional issues with sensitivity and tact. Going to work and being productive makes you happy while Venus is in Cancer. Be careful not to hurt someone’s feelings! Venus in fellow water sign Cancer - and in your love zone - makes this the most romantic time of the year for you, dear Pisces! This is a time to take your fill of love and let it nurture you deeply. You may enjoy a romance with someone who makes you feel oh so special and safe enough to express what's in your heart. Venus in Cancer can also mean a wonderful time bonding with your children and it's a great period if you are trying to conceive. This is also a marvellous time if you are in the creative professions. It's a period of creativity, joy and happiness!